This product may come without the dispense pump. 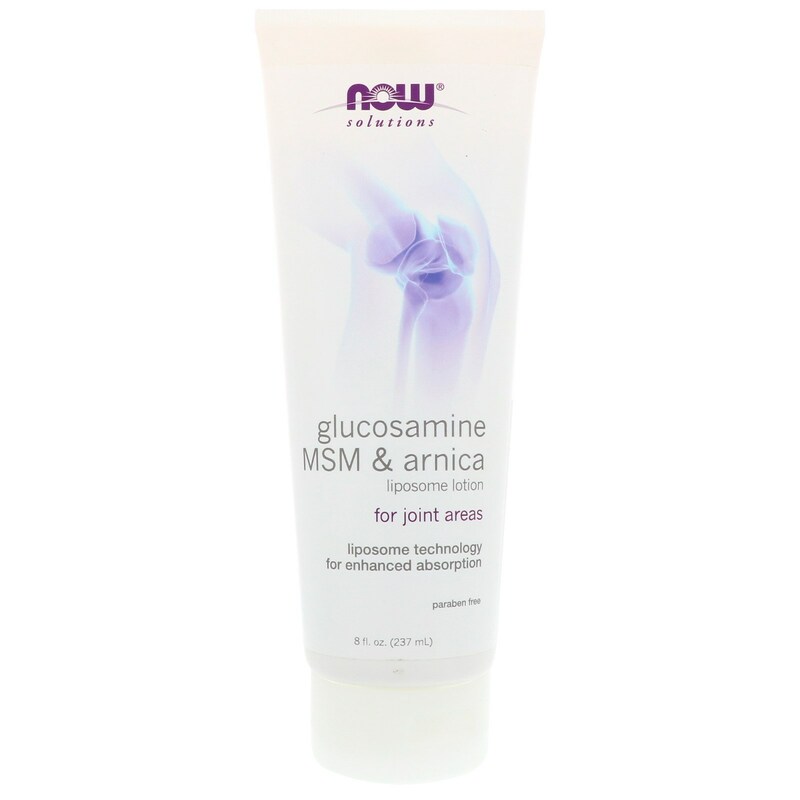 Glucosamine MSM & Arnica Liposomal Lotion is a soothing lotion specifically formulated for use on joint areas. This unique blend of ingredients combines Glucosamine, a normal joint and cartilage component with MSM, a source of organic sulfur. Sulfur is an element known to be a normal component of connective structures. Arnica is well known for its traditional uses. NOW Solutions uses Liposome technology for enhanced absorption. Liposomes are very similar to the different layers of the skin barrier and compatible with cell membranes. Due to their mimicking ability, the liposome can more easily moisturize the skin's natural barrier layers, and allow the ingredients to function more effectively. Massage Glucosamine, MSM & Arnica Lotion into skin as needed, avoiding sensitive areas such as around the eyes. Use daily as needed. NOW Glucosamine and NOW MSM capsules or tablets may be taken internally for nutritional support. Water (aqua), aloe barbadensis leaf juice*, dimethyl sulfone (msm) (methylsulfonyl methane), cetearyl alcohol, glucosamine sulfate (shellfish), glycerin, prunus amygdalus dulcis (sweet almond) oil, caprylic/capric triglyceride, arnica montana flower extract, carthamus tinctorius (safflower) seed oil, stearic acid (vegetable source), ceteareth-20, limnanthes alba (meadowfoam) seed oil, tocopheryl acetate (vitamin E) (soy), phosphatidlycholine (phospholipids) (soy), camellia sinensis (green tea) leaf extract, citrus grandis (grapefruit) seed extract, natural hinokitiol, xanthan gum. Caution: For external use only. Arnica can cause allergic dermatitis with extended use or in sensitive persons. Not to be used on open wounds or broken skin. Persons with a known allergy to shellfish should not use this product. For adults only. Keep out of reach of children.